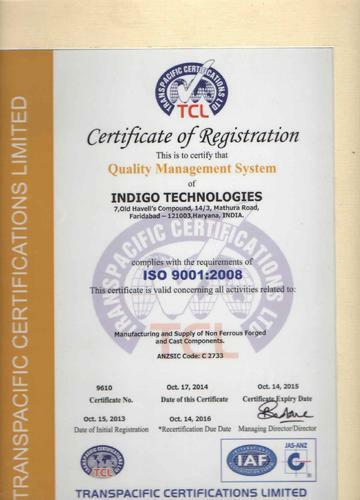 Incepted in the year 1998, Indigo Technologies has become a reckoned name in the competitive industry. Backed by robust infrastructure, we have been successfully involved in manufacturing, supplying and exporting Brass Forgings, Aluminium Forgings and Copper Forgings . We are proud of our efforts in constant innovation, strict quality control parameters and timely delivery that have rewarded us with high level of customer satisfaction. We emphasize to offer our clients' the value added products that are of international standard. We understand our clients' requirements and ensure to provide them complete satisfaction with our quality products and services. For manufacturing high quality products, we procure the raw material from trusted vendors who ensure that the sourced material adhere to the test conducted in our in house testing unit. These products are designed and produced under strict supervision of the supervisors and engineers who see to it that each and every component manufactured by us is in accordance with the specifications laid by the client's. All are products are manufactured using art of technology, which helps in timely production of the products. These products are competitively priced and Supplied in bulk and in Smaller Quantities across the Globe. Aided by our diligent and competent employees, we have managed to carve a niche for ourselves in this domain. We are also able to offer our clients the option of customizing our products to suit their particular requirements, owing to the deep knowledge and experience of our qualified employees. Regular up-gradation as well as periodic maintenance of the machines enables us to derive optimum output without compromising on the quality of the finished product. We have a customer oriented approach and the products we manufacture adhere to the quality standards and to provide a complete satisfaction. Not only this our positive approach and healthy relationship with the customers have helped us in achieving the heights of success. We continuously work for developing a better range of products, which helps in meeting the demands of the buyers in the market. Providing complete customer satisfaction is very important to us. Keeping in mind their needs and technological advancements, we keep developing the products which are complete solution to the needs and requirements of the customer. Our consistency in delivering high quality forgings and allied engineering components have helped us to successfully meet the varied needs of our clients and make many clients in the global markets. The emphasis is on developing strong and fruitful ties with the clients by instilling a sense of trust, respect and faith. We have adopted sensible yet radical business policies, which contributes to the dynamic and progressive outlook of the organization. We manufacture a wide range of products. The forged component offered by us are light in weight and have high density. They are versatile and are resistant to corrosion and have great strength. In addition to the standard range, we offer forged components and products which can be customized as per the industry needs and specifications laid by the client. The products are packed carefully to ensure minimum damage during transit. We realize the important role, our team of dedicated employees plays in the growth of our organization. Just installing the latest machines does not guarantee optimum production, skilled operators are also required to use those machines. Being one of the leading names in forging industries we have always given our best to the clients. We have a special team of engineers who cater to the needs of the industry. All the products are designed under the assistance and supervision of team of engineers who continually strive to develop products to accuracy at every stage of production. With an extensive team of experienced professional we have been able to achieve an expertise in designing precision goods which are used in different industries. We have with us services of experienced and dedicated team of professionals having extensive experience in the field of metallurgical, mechanical and chemical fields. Their in depth experience allows us to have a better control over the quality features of our products. Further their expertise also enables us to adopt cost effective production techniques, ensuring that our range of products are available in the markets at competitive prices. Our products are widely recognized for their features like resistance to abrasion & corrosion while being dimensionally accurate.